its 275th Anniversary and to mark the occasion the above medal was struck. The jewel is silver, and is one of a limited strike of 500 pieces. Each is stamped individually (this jewel is numbered 202). 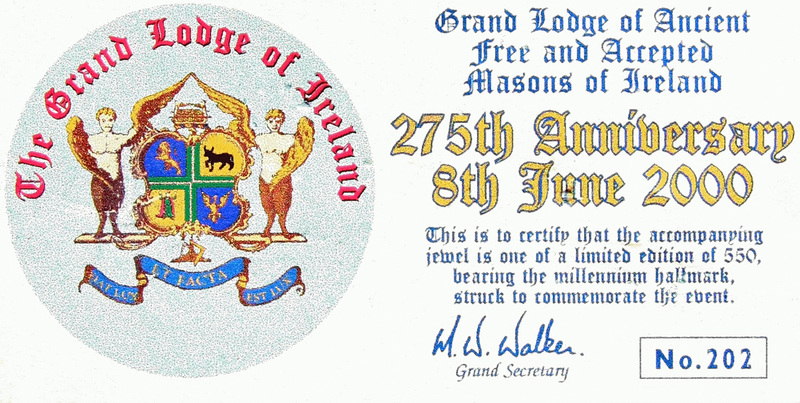 The recipient of the jewel also received a certificate of number card (shown above). Each jewel has the impress of the special silver date stamp for the Millennium 2000. The Jewel is suspended on a white ribbon with Saint Patrick's Cross embroidered thereon. On the Obverse of the Jewel is a portrait of the 1st Earl of Rosse, Richard Parsons, (January 1702 - 26th June, 1741), together with the dates 1725. The Earl of Rosse served as the 1st recorded Grand Master in 1725 (and again in 1730). The portrait that appears on the Jewel appears to based on the painting shown above). The bronze version of this Jewel is shown on the next webpage.